This week Kiernan Shipka has been doing a lot of promotions for the Netflix's the 'Chilling Adventures of Sabrina' and yesterday evening(April 4th) she attended a promotional event for the show at 92Y in New York. 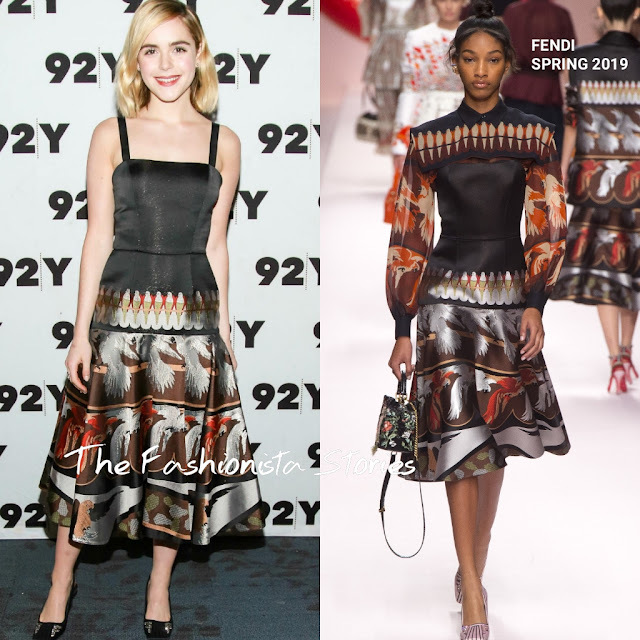 I am not sure if she has a deal with the fashion house or not but Kiernan has been wearing FENDI a lot lately. However maybe she just loves the brand but I like the dress that she is wearing from the SPRING 2019 collection. But for me, I actually prefer the runway's styling because the dress has a chicer appeal. On Kiernan, it's just not that interesting. Also I would swap out the shoes for sandals. What do you think of Kiernan's look?